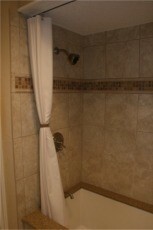 Showers are no longer limited to pre-fabricated stalls or head above an enclosed bathtub. Homeowners, spas and hotels are getting into custom-designed showers to fit their particular needs. The down side is that most of these showers cannot use a curtain purchased off the rack from a store, they require custom-sized shower curtains. We have both vinyl and fabric shower curtains to suit your shower needs. Our vinyl shower curtains include our heaviest option, which is the 10-gauge vinyl Aquaguard. This material is weighty enough to not puff out when you enter or leave the shower. It also features a thick, leather-feel and can be used as a stand-alone curtain or as a durable liner. The other vinyl option is our double polished clear vinyl, which is a 6-gauge clear vinyl curtain. All of our vinyl shower curtains are treated with an antimicrobial to prevent the growth of mildew for the life of the curtain. If you prefer fabric shower curtains, we also have those available. You may select the hotel nylon, which is water repellent and the standard for the hospitality industry. It is also available in the widest range of colors of any of our shower curtain materials. See below for the color options for the hotel nylon shower curtains. The dobie is another of our fabric shower curtains. It gets its name from the deeply woven waffle design in the material. It is made of a 40 percent polyester/60 percent cotton blend. The shower shield is a 100 percent polyester curtain and is 50 percent heavier than other polyester curtains, which prevents billowing. The satin box and the hotel nylon curtains are treated with a water and stain repellent finish. When ordering your custom-sized shower curtain, be sure to add 20 percent to the actual width of your shower's track to allow for complete closure of the curtain. For instance, if you have a 60-inch track, order a 72-inch wide shower curtain. Hooks can be added to most carriers, making a range of tracks available to create a track mounted shower curtain solution.